Guest Pre-Requests | Top Dog Productions, Inc. Your guest can interact with us before your wedding and make requests! You will get your own personalized web address off our web site (you can choose the name). 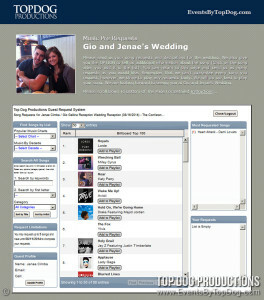 Example: http://www.JohnstownDJ.com/johnandjanedoe For even more customization you can even get your own web address with our help; for example www.MikeAndJillsRequests.com To help ensure that your guest know about this fun feature. We can even provide small instructional cards to include in your invitations. 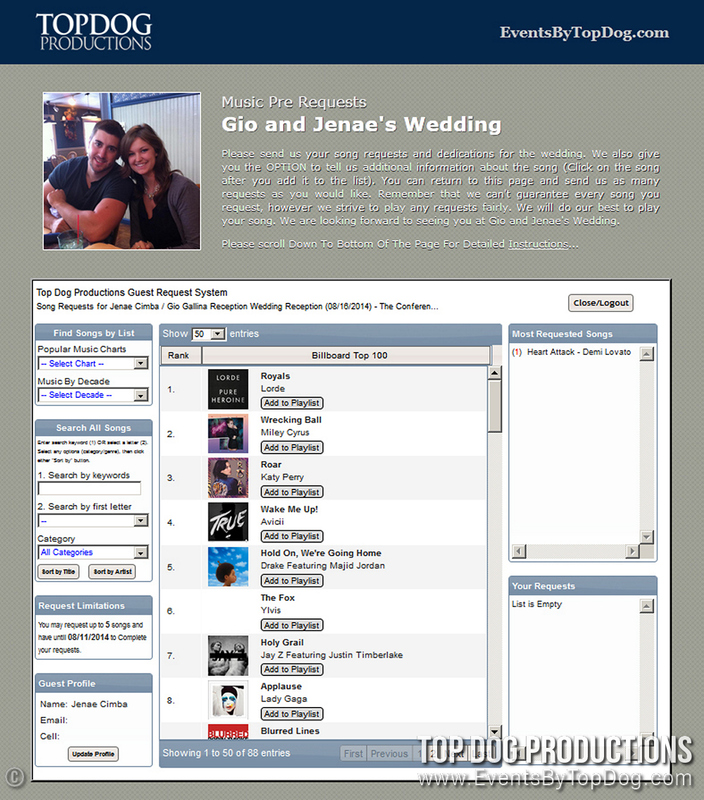 Once your guests access the website they are welcomed with a easy to use “Jukebox Style” interface. Your guests can either browse popular lists or search for their favorite songs. Once they find their favorite song, the selection can be added to the list by simply clicking “Add To Playlist”. Once your guests select their song, a pop up window appears. Within the window lyrics appear and there is a music video preview. Also your guests can list a special memory about the song or dedicate the song to someone. By simply clicking “add to list” the song is placed in the request list.